Highfield Cottage in Melbourne, near Derby sleeps 4 people. Highfield Cottage near Derby is a lovely two bedroom, semi-detached property tucked away down a quiet lane next to the owners’ home, close to a private fishing pond and wooded area. Once stepping inside the property, you are greeted by a thoughtfully decorated interior. Outside, there is offers a garden with a patio area, and steps leading down to the private hot tub, where you can spend a relaxing evening. Highfield Cottage is ideally located to visit the National Trust Calke Abbey, a historic house within a 600-acre nature reserve, along with Staunton Harold Reservoir and its yacht club. The largest inland marina in Europe can be found just 4 miles away at Willington Mercia House, not to mention Donnington race track, which houses the Grand Prix collection in the museum. 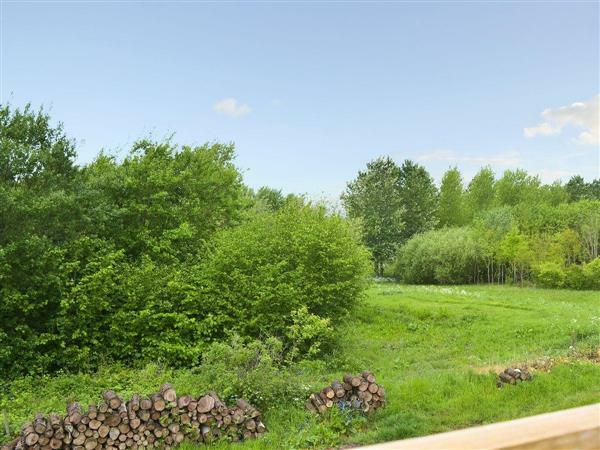 The property lies in the National Forest, where you are given access to a wealth of beautiful countryside suitable for walking, bird watching, cycling and dog walking. Travel a little further north and you will find the Peak District, with Chatsworth House and the historic towns of Bakewell, Matlock and Matlock Bath, with a plethora of activities for people of all ages to enjoy. After a day exploring, you can venture back to Melbourne and enjoy its wealth of shops, pubs, restaurants and fabulous architectural properties. Highfield Cottage really is the perfect place to get away from it all! The shop, pub and restaurant are 1 mile from Highfield Cottage near Derby. Ground Floor: Living room: With wood burner, Freeview TV, DVD player and iPod dock. Kitchen/dining room: With electric range, gas hob, microwave and fridge/freezer. First Floor: Bedroom 1: With king-size bed. Second Floor: Bedroom 2: With zip and link super king-size bed (can be twin beds on request) and en-suite with walk-in shower, toilet and heated towel rail. Gas central heating (underfloor in kitchen/dining room, bathroom and en-suite shower room), gas, electricity, bed linen, towels and Wi-Fi included. Initial logs for wood burner included. Enclosed garden with patio, garden furniture and gas barbeque. Private hot tub. Fishing on-site available on request. Private parking for 2 cars. No smoking. Please note: There are steps in the garden. Holidays at Highfield Cottage run from Saturday to Saturday. Pets allowed at Highfield Cottage. For a better idea of where Highfield Cottage is, you can see Highfield Cottage on the map below. Highfield Cottage is in Derbyshire; should you be on the lookout for a special offer, you can find all the special offers in Derbyshire. It's always worth checking to see what is on offer at the moment. Do you want to holiday near Highfield Cottage (UK4066), you can see other cottages within 25 miles of Highfield Cottage; have a look to find your perfect holiday location.